We are proud to offer humane squirrel control and removal services as a way of assisting you with wildlife issues. If you need a cost-effective squirrel removal Toronto solution, our professionals can help. They deal with a broad range of squirrel and other wildlife issues. Talk to one of our professional technicians today so we can determine how best to help you. If the problem you are experiencing requires a professional solution, we will come out, inspect, and offer recommendations for viable solutions. We can remove them and seal all holes. Once they get in and make themselves comfortable they can begin begin causing more damage to insulation and cables. If squirrels are left on their own the can cause thousands of damage. Even if the squirrels leave, other animals can take their place. Mice, rats and even raccoons can find the openings squirrels made and take over. If you don’t have the problem dealt with professionally you might have to deal with several larger pest and roofing problems down the line. Wildlife Shield explained the process and the associated cost right away. I'm happy to report that the skunk has moved on and the great think is that no other critter can move in under my deck! Worth every penny. Thanks Wildlife Shield. Highly recommended! Starting hearing noises coming from the attic early in the morning and late at night. Called the company, they were very friendly, diagnosed the issue right away (squirrel) and came out the very next day to find the entry point, which they did, and install a door for the animal to leave the attic. It's been ~10 days and no more noises in the attic. From 2015 we had been bothered by aggressive raccoons trying to enter our roof.They wandered boldly in our neighbour hood in the daytime and we were even afraid of leaving our windows open!Thanks to the expertise of Richard, Tom and Simon, we had them trapped and removed.It took several calls to the company and were always treated cordially and fairly.We have since wildlife proofed our roof to prevent future problems.I recommended them to family for squirrel removal as well. Our 2-year warranty ensures the quality of our work and your utmost satisfaction. When we provide you with wildlife control services that involve exclusion, you can rest easy knowing you are covered under our 2-year warranty. The warranty includes removal services for squirrels, skunks, and raccoons. If the animal in questions happens to break through one of our sealed entry points within the 2-year period, we will return to solve the problem at no extra cost. Squirrels often create expensive damages. Squirrels living in urban environments pose a particular problem because there are so many expensive structural damages the squirrels can create. 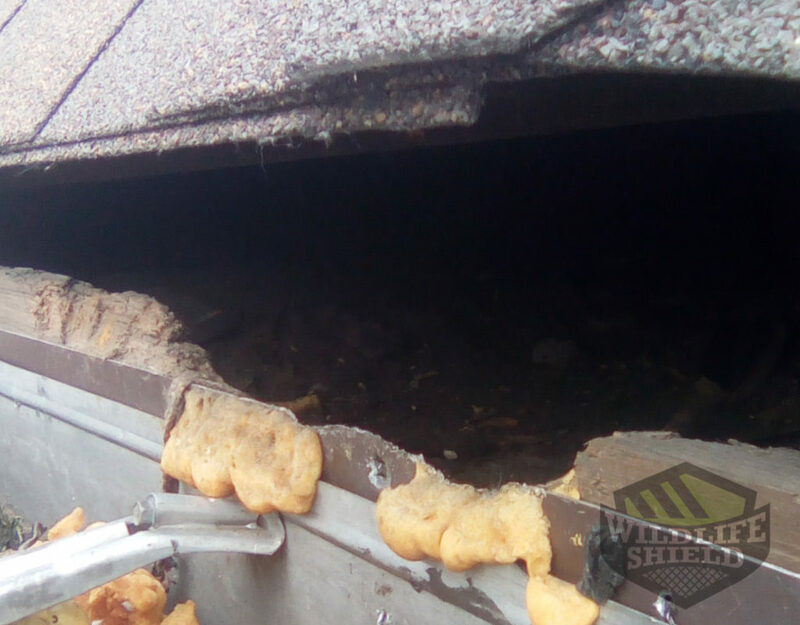 With so many home situated in urban areas, your biggest worry is squirrel damages to roofing materials, soffits, and siding. If squirrels gain access to your attic, you could have an even larger problem on your hands. Squirrels that take up residence in your attic can damage insulation and pose contamination issues with their urine and feces. Aside from the noticeable smell of their urine and feces, you will also have to worry about replacing damaged insulation. Consider the fact that squirrels also have sharp teeth best used for chewing. Unfortunately, squirrels in your attic may take to chewing on wiring and wooden support beams. Not only does this pose a threat to the structural integrity of your home, it also raises the risk of a possible fire hazard. Unfortunately, damaged electrical wiring is not a cheap fix, either. While it might seem that wildlife and humans do not mix, there are plenty of reasons why squirrels prefer to invade areas populated by humans. Humans often waste food, which provides an easy meal for animals like squirrels. Homes built by humans also provides wildlife, such as squirrels, with a readily accessible form of shelter. For that reason, squirrels will often invade the attic of your home. Once they manage to find their way inside, they will get to work building nests. Squirrels give birth twice a year. They first give birth in the spring and then again in the fall. To keep their babies safe, squirrels will seek a safe place to build their nests, and the attic of your home is often the most appealing location. 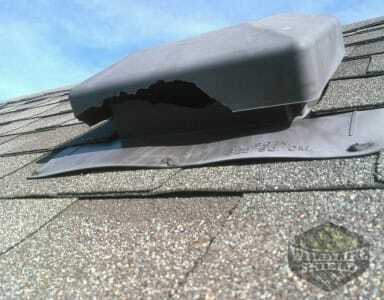 Squirrels will enter your attic by using their sharp teeth to chew entrance holes. They find weak spots under gutters or junctures where the roofline meets the dormers. They will also attack the edge of your trim. Anything they can chew, they will just so they can get in and make your home their home, too. If you suspect squirrels have invaded your attic, you will need to contact us for assistance. Our technicians will perform an inspection of your home. Specifically, the technician will inspect common entry points. The following are some of the most common entry points squirrels use to access your attic. Squirrels will often make use of roof edging to gain access to the attic. 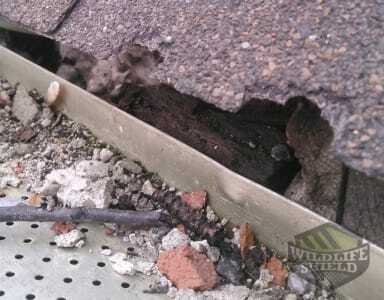 The roof edging, also known as the drip edge, is located behind your gutters. It often experiences a lot of wear and tear from weather related elements. As time goes by, shingles, siding along the drip edge, and roofing boards experience deterioration. Squirrels will use that deterioration to their advantage to enter your home. A solid roofing system will have proper ventilation. Ventilation is a must to ensure the integrity of your attic. Unfortunately, that necessary ventilation system also provides easy access for squirrels. Roof vents cannot withstand the strength of a squirrel’s teeth. The ventilation system provides your attic with proper air flow, but as air escapes the attic, it attracts wildlife. As air escapes your attic, it also releases a flow of good smells, such as the smell of food, which is attractive for a squirrel. Once they catch the scent, it is only a matter of time before they gain access to your attic. Gable vents are also entry points created by roofing ventilation. Fortunately, a technician will inspect that, too. Your home has many ventilation points. For instance, if you have a washer and dryer in your home, you likely have a dryer vent. Exhaust vents in the kitchen or bathroom also usually have ventilation systems that squirrels can access from outside your home. 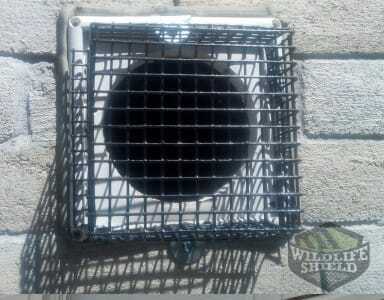 Fortunately, placing steel wire mesh over the ventilation openings can prevent squirrels from gaining access to your home and attic. 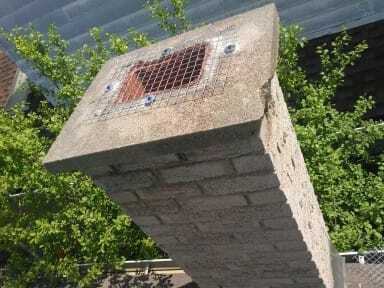 Chimneys, while a nice feature, can give wildlife easy access to your home. Squirrels are opportunistic creatures, so a chimney is like holding a giant sign that says, “Squirrels welcome here!” Make sure you seal the top of your chimney with wire mesh to prevent squirrels from getting into your home. The eastern gray squirrel (Sciurus carolinensis) is a tree squirrel native to the eastern and midwestern United States and to the southerly portions of the eastern provinces of Canada. The specific epithet, carolinensis, refers to the Carolinas, where the species was first recorded and where the animal is still extremely common. The native range of the eastern gray squirrel overlaps with that of the fox squirrel (Sciurus niger), with which it is sometimes confused, although the core of the fox squirrel’s range is slightly more to the west. A prolific and adaptable species, the gray squirrel has been introduced to, and thrives, in Ontario. In the GTA squirrels are mostly black. They belong to the melanistic subgroup of the Eastern Gray. They are active all year round and are most active during the warmer months. In the spring and summer months they spend most of their time outdoors. When the cold arrives the begin to enter roofs and attics. That is where the problems with squirrels begin with most homeowners. Squirrels are known to not only cause disturbances but also a lot of damage. They can break into attics, tear up insulation, chew on wires and pollute a space with their feces and urine. If you too have a squirrel problem give us a call if you need squirrel removal services. We set up one-way doors on entrance points that are used by animals to invade your property. The doors allow squirrels to exit but not re-entry your property. One-way doors permit for humane squirrel removal, whether in an attic or under a deck. While this method might appear simple, but it is not. Some squirrels know how to get through and some may get stuck, and baby squirrels can’t exit through the one-way doors. That is the reason you should hire a specialist. Not only be certain that animals leave but also that no animals get hurt. The positioning of one-way doors ranges based on where entry points are located. Openings around the one-way doors are sealed with stainless steel mesh. The mesh doesn’t rust, and squirrels can’t break in after they leave. When the animal leaves we remove the door and seal the entry point. There are other solutions available, but they are either not as effective or not as humane. One such option is squirrel trapping. Squirrel trapping makes use of a trap placed at entry points. When the squirrel attempts to exit the attic, they become trapped. Unfortunately, it creates unnecessary stress for the animal. One-way doors are far less stressful and far more effective for squirrel removal. The best way to deal with a squirrel infestation is to contact a professional that offers squirrel removal services. Our team of experts can provide you with effective and humane squirrel removal Toronto services. If this is your first time dealing with an infestation, it is best to know what to expect. One of our experts will visit your home and assess the property. They will likely climb on the roof, take pictures, and determine what points of entry exist. After the assessment process, you will receive recommendations for the best method of removal. The professional will install one-way doors that allow squirrels to exit your home, but do not allow them re-entry. If there are baby squirrels involved, they will be professionally removed and relocated to a safe location that is an appropriate distance away from your home. Afterward, the expert will focus on prevention. Prevention protects your home against yet another squirrel infestation. Make sure you never attempt a DIY approach to squirrel removal. You may risk exposure to harmful bacteria found in squirrel feces and urine. You may also run the risk of improper removal that can cause unnecessary harm and stress to squirrels and their young. It is best to accept any prevention methods offered by a technician so you do not have to worry about squirrels gaining entry to your home again. Contact us at for more information about our humane squirrel removal services. Reinforcing your home to protect against an animal invasion is the best way to avoid a potential problem. If you need animal proofing solutions for your home, we can help! Squirrel control and prevention is the best way to keep squirrels away from your home. A squirrel infestation is no small problem. Squirrels can cause significant damages to your home. Fortunately, you can control and even prevent a squirrel infestation before it starts. The Eastern Grey Squirrel is among the most common squirrel species to invade the GTA. They prefer urban areas because of the opportunity to scavenge food and find shelter. They are dark grey to almost black and color, which makes them easily recognizable. Part of what makes the Eastern Grey Squirrel such a pesky invader is that it does not have to leave the attic for at least a few days at a time. The red squirrel is not as common, though it still prefers urban areas, especially the areas outside the city centre. They use a small entry point to enter your attic, which might make them a bit harder to detect. You can identify this squirrel by the reddish-brown color of its coat. If you spot a red squirrel on your property, make sure you contact us immediately for assistance. Adult squirrels are one thing, since they can exit the attic on their own, but young squirrels that are not big enough to leave the nest are another story. A technician will inspect for signs of squirrel babies and safely remove them if necessary. There are specific times during the year that squirrels have babies, which is the spring and fall, so technicians will take great care in ensuring there are no squirrel babies left in your attic. When squirrels get inside, they use an attic as a latrine. The longer they remain inside, the more waste they produce. We securely remove all feces and deodorize the region with commercial grade products which break down odour and germs. 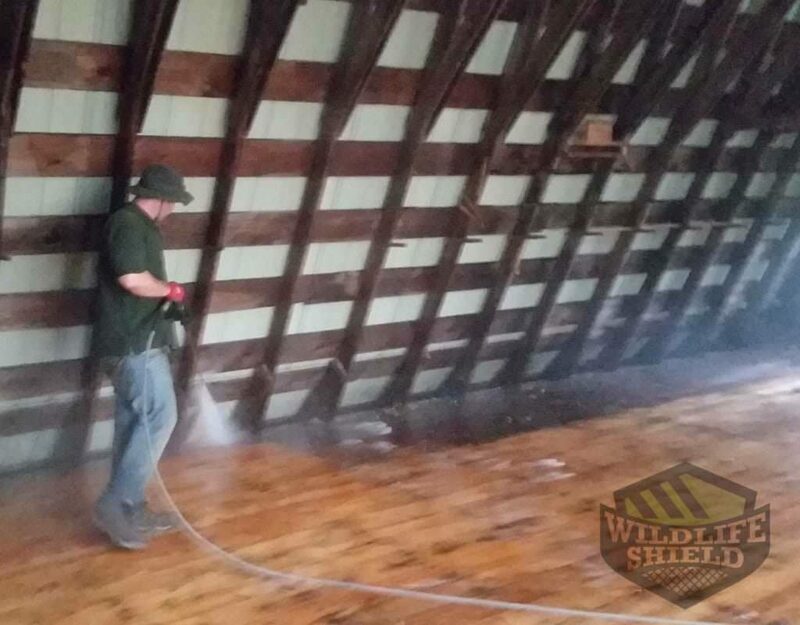 After animals are removed we disinfect the attic and entrance points to get rid of any animal odor. We use industrial products which destroy odour even if it is produced by excrements, urine or bodies. When squirrels stay in an attic for quite a while, the insulation becomes compacted and polluted beyond repair. 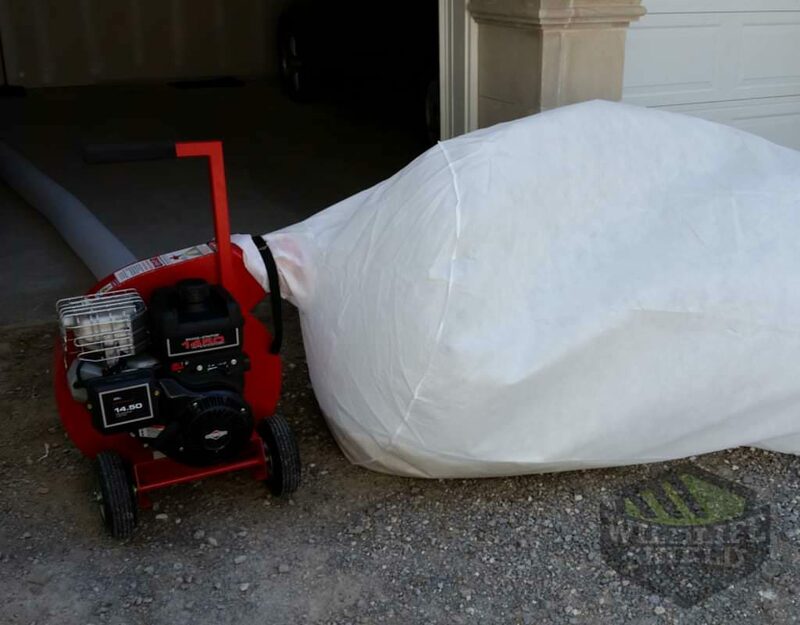 Compressed insulation drops its insulation capacity and has to be replaced. We eliminate contaminated insulation and wash out the attic space so it’s prepared for a brand new batch of insulating material. Besides, the germs contaminated insulating material will produce strong smell that sometimes can be felt in the living room.